WordPress Multisite installations are governed by the same limits as any normal website or account hosted on WPX. Note: Subdomains created within a WP Multisite installation do NOT count against the number of available website slots in your WPX account however, normal non-Multisite subdomains DO count against the 5, 15 or 35 website slot allocations for each plan. 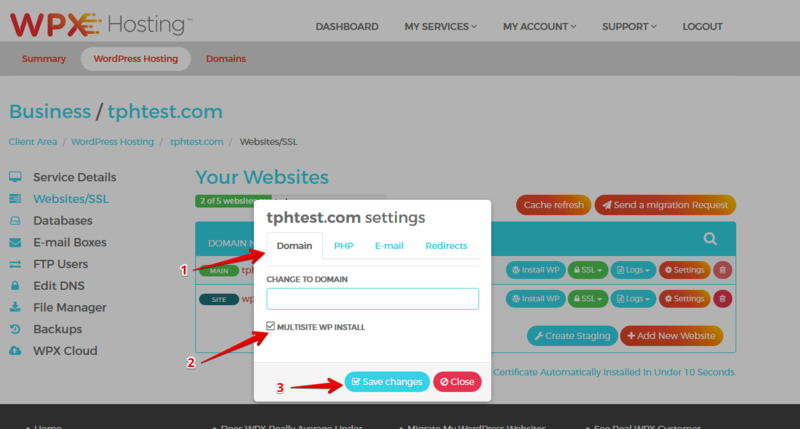 You can enable your website to support a Multisite installation with a few simple steps via your Hosting Panel. First, you must to go to your Hosting Panel, which you can do via our website. Log in to WPX and select My Services (1) → WordPress Hosting (2) → Manage all Sites in this Account (3). You will be arrive directly in the Service Details section of your Hosting Panel. In the left menu, select the Websites/SSL (1) tab. You can manage your websites from this menu and on the right side of each website name, you'll see the Settings (2) option. Click on Settings and a pop-up menu will open, where you can enable Multisite. That's it! You have now activated WordPress Multisite! You can see more information about the WP Multisite installations on WPX (and visit our WordPress hosting in Singapore here). Learn more about WP installation and our hosting in Netherlands here. You can check out our customer reviews on Trustpilot. Here are 5 ways to speed up your website (see listed here). You can head over to our Facebook page (and follow us for updates here). Find why WPX is the winner in this competition.